Compared to the Netherlands colourful capital Amsterdam, The Hague is a little buttoned-down, but that is to be expected of a city that is both the seat of the Dutch government and an important centre of world diplomacy. In The Hague are the Dutch parliament, the Supreme Court, the government ministries, the International Courts of Justice, and all embassies and consulates. The Hague is also graced by royal presence: Queen Beatrix works in the Noordeinde Palace, in the wealthy Hofkwartier area. Unlike other Dutch cities, The Hague has very few canals. Instead it has broad, tree-lined avenues, stately 18th- century baroque mansions, and office buildings in the Art Nouveau style. In certain districts, the elegance gives way to more modest social housing, small parks, sports centres and apartment buildings. A visitor to The Hague would be unable to take in everything in a day or even a week, but a typical tourist checklist should include the Passage Mall and its boutiques and specialty shops, the elegant Lange Vijverberg street, the five-star Hotel Des Indes in historic Lange Voorhout square, and the museums that house the works of the great Dutch masters Vermeer, Rembrandt and van Gogh. 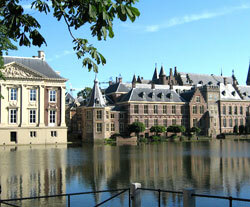 The Hague also has a famous resort town. Scheveningen has been a major attraction since the 19th century. Millions of visitors make the trip to its beach every year. At night the city loosens up a little, and its three main squares become abuzz with activity. Bars, restaurants and caf�s come to life in the Buitenhof Square and the Plein, and shoppers swarm into the city's Grokt Markt (Great Market). The Hague's population is an interesting mix of native Dutch and immigrants. This is reflected in the food the city has become known for: from the simple, largely fish, cheese and vegetable-based Dutch fare, to the richer, spicier dishes of Suriname and Indonesia, plus the cuisines of dozens of other countries from Turkey and Morocco to Italy and Japan. The Hague's cosmopolitan atmosphere is enhanced by its large international community ambassadors, diplomats, civil servants, embassy workers, and employees of the international courts, multinationals and lobbying organizations. The Hague centre's wide streets lead to spacious parks, office buildings, and eight distinctive stadsdelen, or districts.